Gold Collagen mask activates skin cells, rejuvenates and tightens the skin, boosts collagen production, and fight the free radicals that cause aging to return the youth and elasticity to your skin. It stimulates cellular growth to regenerate healthy, firm skin cells and provide a lightening effect. It also, reduces the appearance of fine lines and wrinkles. Plus, it lightens and brightens the skin. GOLD with Collagen fights off damaging free radicals to help prevent premature aging of the skin, provide a golden glow by creating luminous, radiant skin. 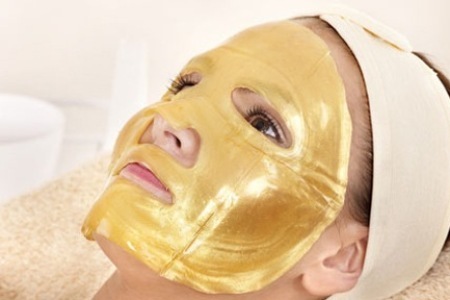 With this amazing Gold Collagen Mask you will enjoy a luxurious feeling of relaxation. 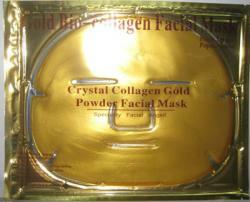 The Collagen Gold Mask is proven and tested to moisturize and hydrate the skin at a professional level. It rebuilds collagen giving your skin a more firm feeling. Helps reduce fine lines and wrinkles with every use. You will look and feel years younger and your skin will glow with a subtle shimmer. Remove mask and place swirl side down evenly against face to ensure good contact to the skin. Lightly massage the remainder of the serum into the skin until it is completely absorbed. 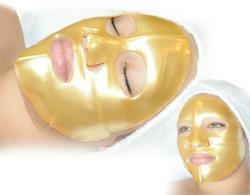 Apply a Collagen Gold Mask whenever you are looking for a rejuvenated glow throughout your day or night. Alcohol and animal oil free. Pure plant essential oils and natural fragrance . 100% stress relieve and reliable make your skin young , beautiful and extra smooth . i yust love this mask it makes you face like a baby, its fells soft.